I was thrilled when I found out Amanda Hocking was going to write another book series set in the Trylle world. If you didn't know, The Trylle Series was the reason why I'm now a bookworm. In that series I was actually torn. I wasn't a big fan of the love triangle because it was a little predictable who Wendy was going to end up with. However, I still loved that series because it made me get into reading. Frostfire was satisfying and I was happy with how this new series started. I did have a good feeling about it before reading the book. I adored the new characters and the old ones like Finn Holmes and Ember Holmes who appeared in the previous series. The main character Bryn was a pretty tough character and that's what I loved about her. Although, like Finn, she took her job very seriously and wouldn't do anything to distract her from her job such as Love. "For you, I would lay down my life any day." Ridley reminded me a little bit of Finn. Though, he's less mysterious. He's a little older than Bryn, but I felt like they were the same age. The romance in this book wasn't that big, like Switched (the first book in the Trylle Series). I didn't really mind because the story in general was interesting and a little bit of romance wasn't a problem for me. Unlike the last series, I actually wanted a love triangle. haha. Konstantin Black was very mysterious and I was really curious about his character. Even though he was the enemy, I felt like there was something good in him that the others didn't know. I think he was just blackmailed by someone who was much more superior than him. Her New York Times best-selling series the Trylle Trilogy has been optioned for films. She has published fifteen novels, including the Hollows and the Watersong series. 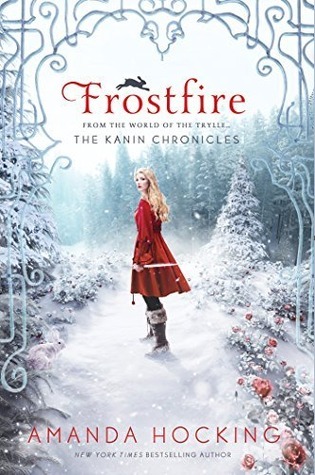 Frostfire - the first book in her newest trilogy, the Kanin Chronicles - is out now, and the second book - Ice Kissed - will be May 5, 2015.